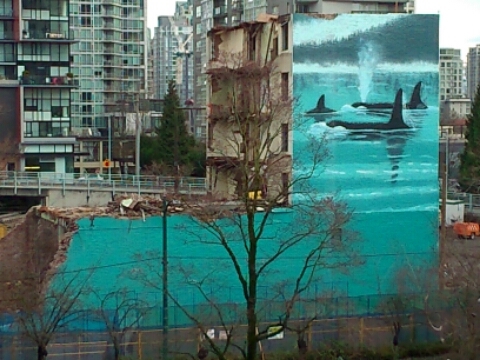 The orcas painted on the side of the building were spectacular. I’d seen someone pull that face before. Back in 1977. Eventually, I convinced her to come with me to her mother’s favourite place. The bluff overlooking the ocean. Out to sea, black dorsal fins skimmed the surface. I wasn’t sure she’d noticed. But then she looked at me, her face softened and she snuggled in close. The real battle had already been won. Back in 1977. On a zodiac 30 miles out to sea. At the end the real Orcas matter more than the painted ones for sure. Glad you liked it, but Rochelle deserves the credit, as always. I love it, they have such a great relationship and both know what really counts. Very nice. This was just a real feel good story Jess. Glad you thought so Dawn! I was trying for something a little sweeter this week. What an excellent story! And so true, we look at pictures instead searching for a real thing. Yep, a lovely summary 🙂 thanks for the read! Lovely, and yet not all the world has access to any more than a picture. Good job! It’s good that she’s just like her mother – the good fight needs to go on. Beautifully told. Nice story, very well rendered.